In a post on foods for a flat tummy, we have mentioned about sassy water. If you are not familiar with sassy water – it is flavored water named by Prevention magazine in honor of its inventor Cynthia Sass. She created it for the “Flat Belly Diet”. This water tastes greater than ordinary water. With almost no calories, the ginger content actually helps to calm your digestive system. Following is Cynthia’s original water recipe. How to make sassy water? Wash the citrus fruits thoroughly well before slicing. Slice them into small circular pieces. Pour water into a large jar and add the plant ingredients. Tear the mint leaves just a little to release the flavors and add them to the jar. Cover it and place it in the refrigerator overnight. 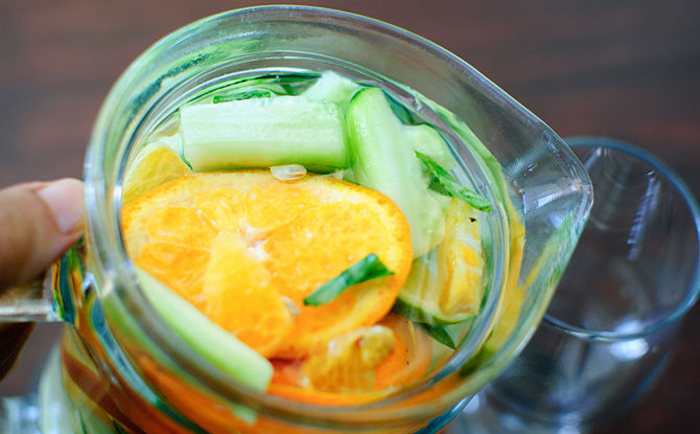 This entry was added on May 25th, 2013 by Jameela Beevi in Vegan and tagged with flavored water, flat tummy food, lower weight, sassy water, how to make sassy water, sassy water recipe. Last revised on March 29th, 2018.